The Maranatha fee covers local housing during the project, three vegetarian meals a day, ground transportation to and from the airport and project site, local excursions, short-term travel insurance, a Maranatha t-shirt, and luggage tags. For accounting purposes this is broken down into a project fee of $955 (tax-deductible) and an excursion fee of $670 (not tax-deductible). Flights, passports, entrance visas, and vaccinations are not included in the participation fee. Children ages 12 and under receive a $150 discount. Maranatha is headed back to Zambia! From 2010-2014 Maranatha sent volunteers to construct churches and schools throughout the country. Now, four years later, Maranatha is responding to the request of the regional church leadership and is once again headed back to Zambia. We will begin work at the Kabwe Adventist Primary School. The school currently has 473 students from Pre-K to Secondary, 350 of those students are in the primary school. They currently meet in a very small, crowded facility in the heart of the city. The school is well-run, but they are severely limited by space. To solve some of the problems, the school would like to move the primary portion of the school to a new location on the outer edge of the town on a piece of property with the new conference office. Maranatha volunteers on this project will be assisting with the masonry construction of a new 12-classroom school campus. If we have enough skilled volunteers register, we would also like to reach out into the community through activities such as vacation Bible school programs and health education. This project also includes a safari excursion and a visit to the world-famous Victoria Falls at the end of the project. ARRIVALVolunteers will arrive in Lusaka, Zambia (LUN) before 3:30 p.m. on Wednesday, November 14, 2018.Please wait for confirmation from Maranatha before purchasing your airfare to ensure there is still space on the project. DEPARTUREVolunteers will depart from Victoria Falls, Zimbabwe (VFA) on in the morning or afternoon of Wednesday, November 28, 2018. During the project, volunteers will stay at a basic hotel between a 1- and 2-star facility, depending on how you rate hotels. We chose this hotel because it’s adequate and clean, and it’s close to the job site so it doesn’t require a long drive each day. We mention this in advance so you can adjust your expectations. It will most likely be a lower standard than where you currently reside. The hotel has clean rooms furnished with bedding, towels, and mosquito nets. Washcloths are not commonly provided in Zambia, so you may want to bring your own. Each room has air conditioning and a private bathroom. There is hot water at the hotel, but not all the rooms seem to be able to access it, so be prepared that your room may or may not have hot water. There is a Wi-Fi connection in the reception area of the hotel, but not in the rooms, and the connection is not always reliable and will definitely be slower than you might have at home. The group will have meals together at the conference office kitchen on the same property as the construction site,just two blocks away from the hotel. Volunteers should plan on staying in double occupancy rooms with a roommate. Families will be kept together. If you would like to room with someone in particular, please let us know prior to the final deadline of the project. On the excursion, volunteers will stay at a nicer hotel in Livingstone and Victoria Falls. The hotel is not yet locked in. Volunteers will purchase their own round trip plane tickets to for the project. The dates posted are the arrival and departure dates from the project, but due to travel time, you may need to leave a day or two before the arrival date. Maranatha representatives will meet volunteers upon arrival. Please wait for confirmation before purchasing your airfare to ensure that there is enough space on the project. More information including arrival and departure airports and time windows is available in the information packet (download above). Booking outside these windows could result in additional fees and missed portions of the project. When contacting the Azumano or Butler travel agencies, make sure you mention Maranatha for discounted booking fees. After the project, volunteers will spend a few days enjoying the beauty of southern Africa. Volunteers will head south to Livingstone, Zambia where they will spend the night. On Monday, the group will see Victoria Falls from the Zambia side before crossing into Zimbabwe to see the fallsfrom the other side. Victoria Falls is one of the seven Wonders of the World, and it is truly a magnificent sight.Upon arrival in Victoria Falls, you will hear the thundering of the water and see the mist that rises more than 1,600 feet into the air. The falls are more than a mile wide, and nearly 150 million gallons of water cascade down the drop off each minute during the peak of the Zambezi River’s high water flow. In the afternoon, volunteers will get achance to see the falls up close and personal before having free time to explore the city or do other activities for an additional charge. That night, volunteers will will enjoy a sunset river cruise on the Zambezi River. The following morning the group will cross into Botswana and enjoy a full-day safari in Chobe National Park, a nature reserve that has one of the largest concentrations of game in Africa. Volunteers will get a chance to see all kinds of animals including elephants, hippos, zebras, lions, cheetahs, and much more. On Wednesday, volunteers will have the morning free to explore the town or relax at the hotel before departing for home from Victoria Falls, Zimbabwe. The excursion portion of the Maranatha fee covers everything you’ll need during the excursion including accommodations, local transportation, meals, and entrance costs. If you’re unable to join the excursion for the project, please contact Maranatha for information on how you can still join the project portion of the project. Passports valid for at least 6 months past return with two blank visa pages. 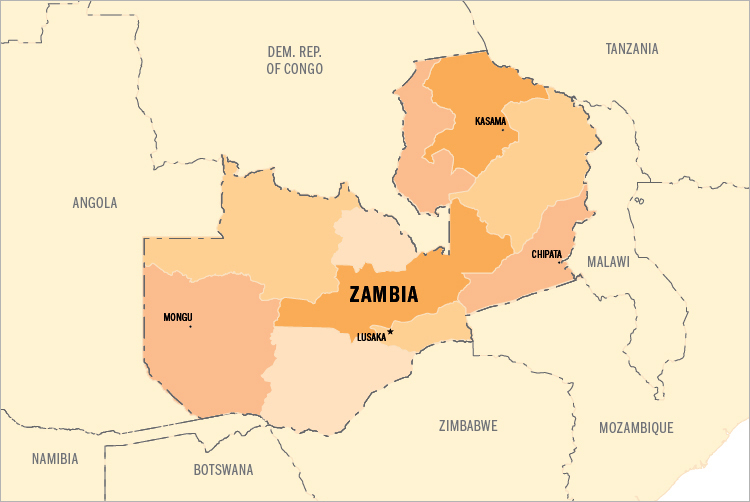 The Zambia Project has ended, please view our Volunteer Opportunities page for upcoming projects.